Those of you who know me know that I am a huge fan of Martin Popoff’s work. Lately, his bibliography seems to be growing in leaps and bounds. This new “album by album” book follows the format of his previous Rush book with a similar title. Each chapter is focused on one release, flowing in chronological order. 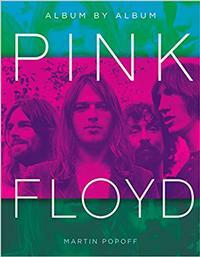 It's peppered with color photos of the band, their releases, and assorted memorabilia. What makes this book (and the Rush book) unique is that while there is a little back story to each album, Popoff elicits the opinions and thought from other journalists, musicians and people in the industry who give their own perspective on the music. Some of the folks are familiar to prog nerds like myself = people like Nick Beggs (Kajagoogoo), Steve Hackett (Genesis), Steve Rothery (Marillion) and Jordan Rudess (Dream Theater). Other are not familiar names to me like Roie Avin, Craig Bailey and Robert Corich, but reading their insights into the albums makes you look at the music in a whole new light. Also, we get additional juicy tidbits that occurred behind the scenes during the making of the music. One item that I had not known previously was that Jordan Rudess almost made it onto The Wall track “Bring the Boys Back Home." I won’t spoil the story by revealing the details here, but it is just one of those little pieces of information that makes this book a must for any Pink Floyd fan. While I don’t share the same opinions as some of the folks, this book inspired me to go back and listen to those records again with an open mind (and open ears), which is what a good music book is supposed to do.